The global 2-shot injection molding market is anticipated to witness a significant rise in coming years due to the presence of highly fragmented market scenario. There are vast number of players operating in the market, owing to which the landscape seems to be quite competitive. Each of these players hold some amount of share in the market, due to which the competition is expected to soar in coming times. According to a report by Transparency Market Research, the global 2-shot injection molding market is estimated to expand at a steady CAGR of 6.5% within the forecast period from 2016 to 2024. From a valuation of worth US$6.6 bn in year 2015, the market has soared to a worth of around US$11.5 bn by the end of the forecast period. Some of the major players in the firms are Paragon Rapid Technologies Limited, Gemini Group, Inc., Nyloncraft, Inc., Gemini Group, Inc., and Rogan Corporation. The major players are working upon bettering the production volume, so as to maintain their relevancy in the market. Moreover, they are highly focused to reduce the lead time, to project the competitiveness. As per the application, the global 2-shot injection molding market is categorized as automotive, medical, consumer goods, packaging, industrial, and electronics and electrical. Among these, the automotive segment accounted for the major share in the global market with respect to revenue, back in 2015, holding around 20% of the entire market. 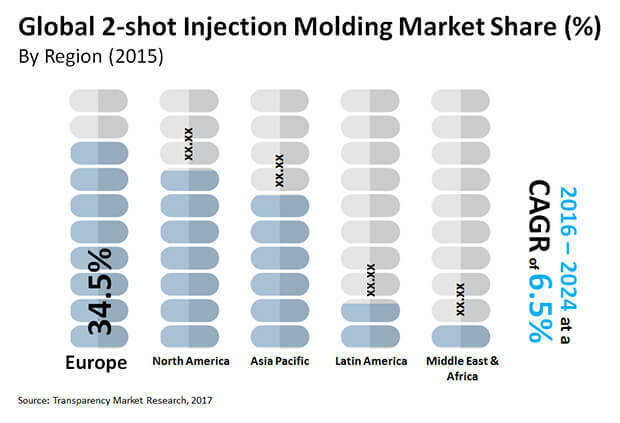 Geographically, Europe, in 2015, accounted for the largest market of 2-shot injection molding with near about 30% of the market. The segment is foreseen to sustain its position in the forthcoming years as well, because of the high focus on the improvement of product portfolios and product differentiation to improve its market position. One of the major hindrances of development in the global 2-shot injection molding market has been foreseen to be the over the top cost of gears and tools in contrast with that of those utilized as a part of traditional molding. Besides, makers could be demoralized to receive 2-shot injection molding in their production procedure because of significantly high initial investment cost. The limited options of material pairs which could be utilized for 2-shot injection molding have been anticipated to hinder the market. In any case, the report has anticipated that some unseen aspects to indicate the scenario in the global 2-shot injection molding market. These could be through rising government emphasis to reuse plastics. OEMs could be urged to build up the reception of 2-shot injection molding as tight government controls stresses firms to reuse materials. A main preferred standpoint of executing 2-shot injection molding is that the center of any two element parts could be extracted from reused plastic while getting rid of any adjustment in its property or appearance. In such manner, the lifting surging of reused plastic has been forecasted to look good for the market. The demand for 2-shot injection molding has surged notably because it enables production of very precise parts with exact repeatability by the help of just on tool. Cost-effective nature of 2-shot injection molding is likely to fuel market growth.